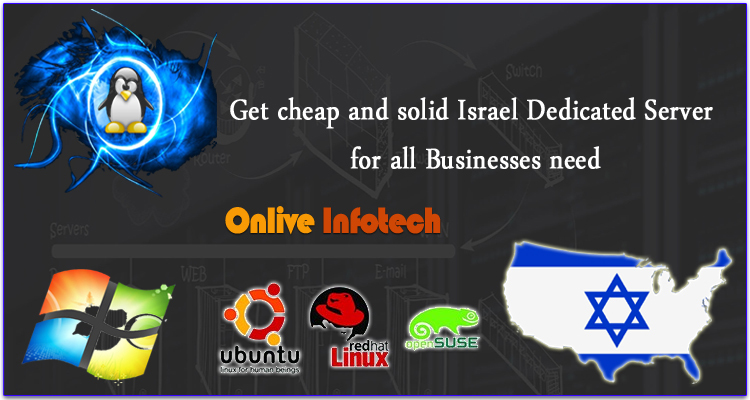 If you are worried about to find a right Israel Dedicated Server at the cheapest price and enrich with lots of dedicated features for your business purposes then Onlive Infotech has the solution for it as it brings dedicated hosting server at a very affordable price so that every business class could take the benefits of it. Our dedicated hosting servers are mainly designed to deliver you a powerful, flexible, reliable and web hosting dedicated server at a very low price for your small or medium business. With our dedicated hosting server, we provide you our own data center which will be nearby you to give to maximum network redundancies. Because of the nearer data center, you will feel free from the network issues and get 99.99% network uptime guarantee. Our dedicated hosting solution provides you full control over your server so you are allowed to do any editing which you require and can do any modification on the basis of your need. Due to its customizable features, you can easily add or remove any software which you want on your server. With the help of our dedicated hosting server, you can easily host your huge or complex websites. Due to servers high bandwidth, you will easily host your websites and able to generate more traffic. We provide you up to 4Core × 2.5 GHz processor, up to 16 GB RAM, up to 300 GB HDD storage to store your large amount of data. Now, these days in the world of dearness it’s very hard for us to find a dedicated server at the lowest price with lots of dedicated features but with us, you will get it. Apart from a good service and a lot of Cheap Dedicated Server Hosting features we also provide you a nice technical support team which always aware towards your server issues and resolve it whenever you need. So our expert technical support team always available for you. You can feel free to contact them any time regarding your any server issue. They monitor your server all day and night to give you best support. To protect you against any malicious software we provide you server scanning against facility as well firewall protection to your server. We also protect your server any unauthorized login. So you can use our cheap and solid Israel Dedicated Server to fulfill your all business needs.